One of the most patronized car brands in Nigeria, KIA Motors Nigeria has unveiled its new 2018 KIA Sportage in Lagos. According to reports, KIA unveiled the 2018 KIA Sportage during the week at a launching and media parley with motoring journalists, held at its showroom, in Victoria Island, Lagos. 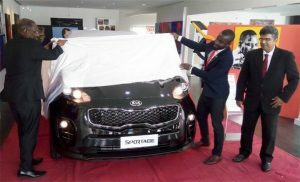 An official of KIA motors who spoke to newsmen said the unveiling of KIA Sportage in Lagos showroom is one of the most anticipated and remarkable moment for KIA Motors. The new Sportage compact SUV is a show-stopper, considering its attractive design, a range of advanced technology features and greater quality.